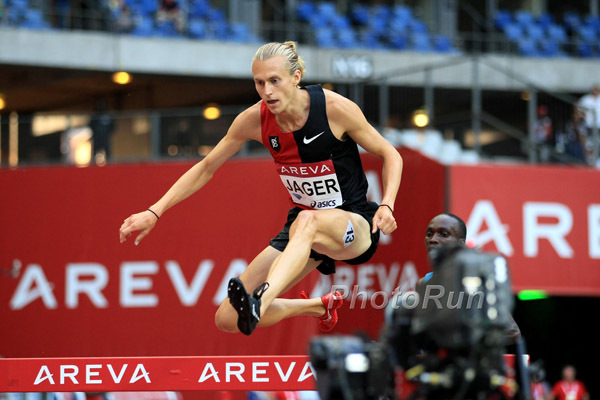 World steeplechase medalist Evan Jager opened his season with a win at the Bryan Clay Invitational last week in California, an event where several of his Kimbia colleagues were also in action. Jager took a narrow win over Isaac Kimeli of Belgium in the men’s 5000m, holding on down the home stretch to break the tape in 13:24.77, just in front of Kimeli in 13:24.92. Suguru Osako of the Nike Oregon Project was third in 13:29.11. This was Jager’s third race of the year, having finished fifth at the USATF Cross Country Championships and clocked a 3:58 mile indoors. Fellow Kimbia athlete Lopez Lomong was unable to finish in the same race. In the women’s 5000m, Amy Cragg failed to finish in her first outing since clocking 2:21:42 to finish third at the Tokyo Marathon in February. Colleen Quigley started the outdoor season the way she raced indoors – impressively – as she took second place in the women’s 1500m in 4:07.01, not far behind her Bowerman Track Club teammate Shelby Houlihan (4:06.07). Courtney Frerichs finished ninth in the same race in 4:14.62, her first race since last year’s outdoor track season. Full results here. At the USATF Road Mile Championships in Iowa, Henry Wynne finished 13th in 4:07.99, a race won by Riley Masters in 4:03.99.